This app is awesome! I was kinda worried about it at first because yahoo or ESPN will recommend the player you should take with your next pick. 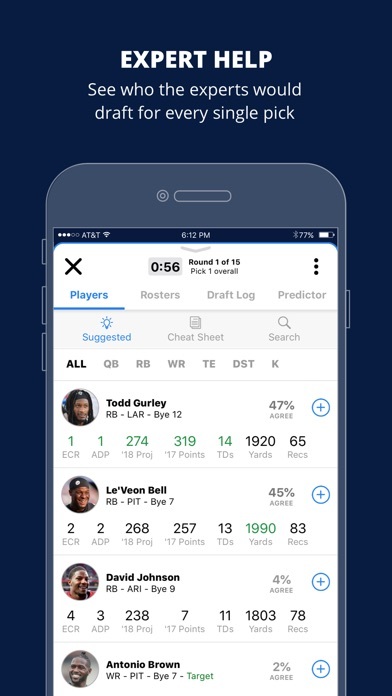 Not this app it goes into much further detail and I like it because not only does it suggest the player you take but will let you know about same bye weeks. After linking this to my yahoo fantasy draft I ended up with the no 1 overall starters, bench and overall team. You obviously don’t have to take who it tells you to take but I highly recommend this for your league. Ive used it in both leagues and projected to win the league and each week by double digits. 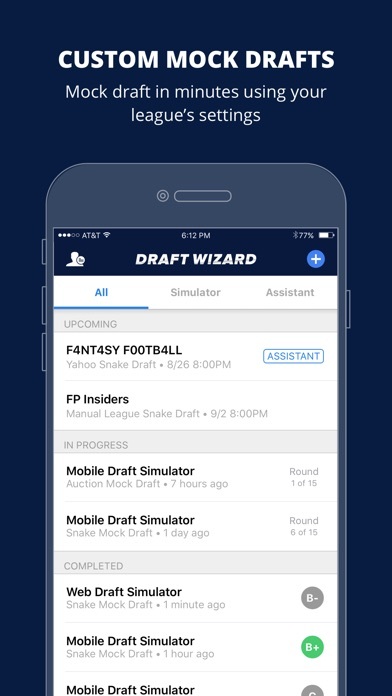 Must have app for fantasy players. Paid premium the get the draft synch and suggestions based on my team and available players. 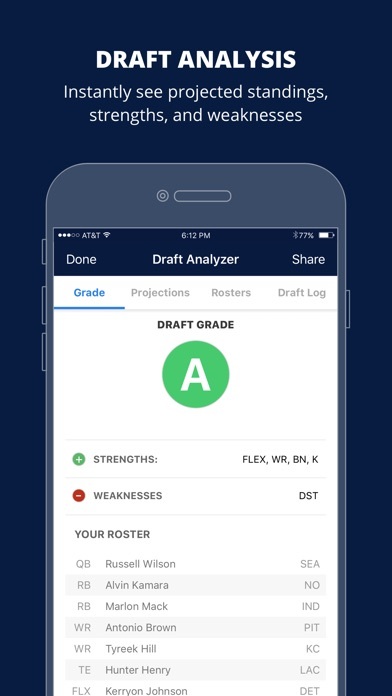 Might be helpful if the app didn’t think you were 8th in the draft when you were actually 10th - gave me suggestions based another player’s team development. For example - already had a QB and kept suggesting to draft a QB. I also drafted player who were ruled out for a few weeks so not up to date. Disappointing given the steep price! Confession...hard to get...still not working the it did previous years.Not happy with it.Loved it past couple of years. When synced(purchased) none of the teams were with the write owners which did nothing for me when drafting, I want my money back!!!!! I never write reviews, so this should exemplify how important this app truly is. 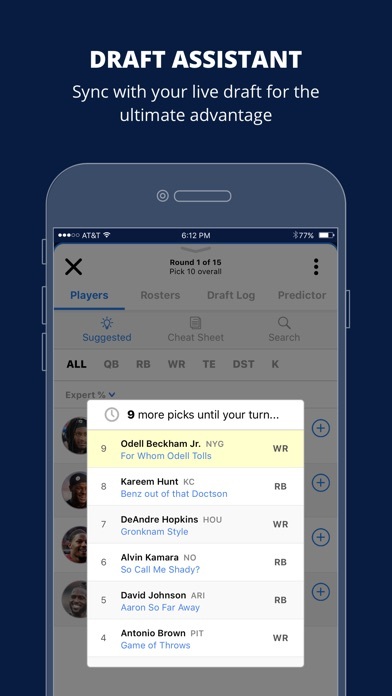 User friendly interface to make sure Fantasy players are prepared for their drafts. When it works its great, worked fine for two live drafts. 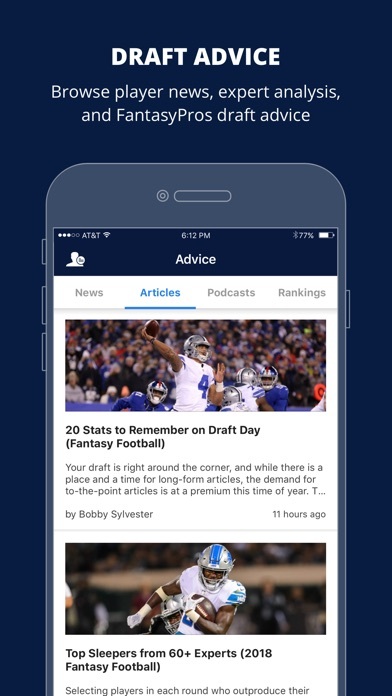 Then right before the one league i care about, the app crashes and wouldn’t let me edit my league features. total fail. I had to do the rest of the draft based on memory. Needless to say, I wasn’t happy with the results. New update won’t let me change my draft order. Pretty pointless practicing with the 10th pick when I actually have the 3rd pick! 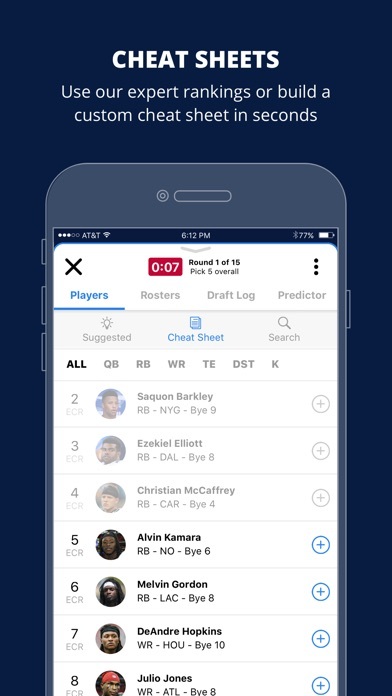 Went to us the app the day of our live draft and after the first 11 picks it would not register any more picks. Unbelievable that I was planning on relying on this app to assist. Thankfully I had printed out my sheet ahead of time. I had paid for the middle of the road of option to assist in drafting but it the website failed miserably at doing what it was designed to do. I will be canceling further payments and will not be using next year... be warned.